Construct the pond correctly: Choose the perfect location in your front or backyard. Depending on your desired pond size, make sure the water level does not become a concern. Maintain the right temperature: If you plan on keeping ornamental or garden fish in your pond, keeping the correct temperature in your pond is essential. Avoid overfeeding: Using an koi fish feeder will eliminate the worry of consistent feedings and will save you money on feed. Keep pond supplies: In this sunny weather, you’re going to want to keep your pond shiny and new. Regular cleaning of your pond will add longevity to your pond and keep the quality of your fixtures. Conduct constant water checks: Maintaining the pH level of your pond is also an important consideration, especially when adding fish, vegetation or flowers in your pond. The warmer weather also decreases the amount of oxygen in the water. Since the metabolism of the fish is higher in warmer temperatures, the fish use much more oxygen than in cooler climates. So, aeration in the pond also needs to increase. This means pulling out the aquatic vegetation that may have grown in your pond. If left, these plants can consume the oxygen fish need to survive, especially in the non-daylight hours. Attention should focus on algae and weed species that tend to develop in the early spring season. These plants can become a threat to the health of your pond, limit the effectiveness of your fish to find food, and diminish the amount of oxygen available. Throughout the warm months, algeacide can be used to help control this algae growth. Spring is the time to to clean your koi pond and refill it with fresh water. After removing the aquatic plants, pick out any debris that may have fallen into the pond with a fine mesh net. If there is a heavy buildup of debris, you may need to remove the fish in order to clean the pond. Fill large containers with pond water and transfer the fish into them, while you drain the pond and scrub its walls. After the pond is clean, replace the water. 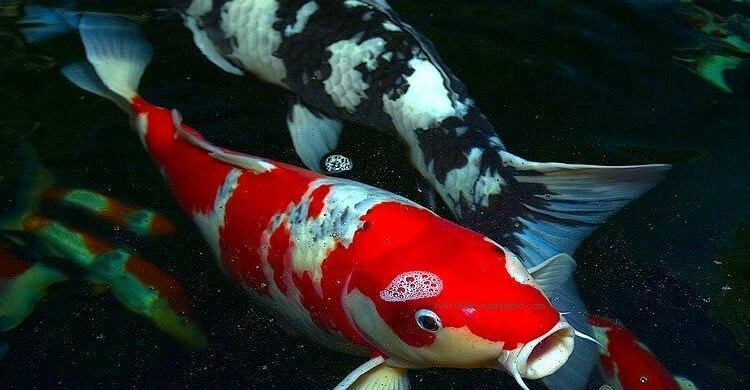 Be sure to add a dechlorinator to the water before adding back your koi fish. Looking to add some color to your backyard? Visit Sweeney Feeders for premium, automatic garden fish feeders. They’ll help you save time and effort for providing the best care for your koi fish.